This Federer Team 12 racket bag has many features that are perfect for elite players who take their game seriously. Designed to hold up to 12 frames, this bag has a large compartment for holding shoes and apparel along with additional accessory pockets to store valuables securely. The comfortable padded straps allow the bag to be carried as a backpack while the molded plastic gives the bag the ability to stand upright on its own. 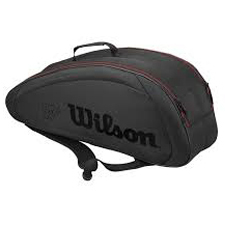 Do you own the Wilson Federer Team 12 Bag Black?